C S Lewis’s Chronicles of Narnia are loved by both the young and the young at heart all over the world. Whilst they can certainly be enjoyed on their own merits as pure, escapist fantasy adventure stories, their writer often implied that they had a deeper meaning. Lewis, a prodigious letter writer, once wrote to a young reader as follows: “I’m so thankful that you realised the ‘hidden story’ in the Narnia books. It is odd, children nearly always do, grown-ups hardly ever”. It is noteworthy that Lewis, who was otherwise quite willing to talk about his work, never elaborated as to what precisely this ‘hidden story’ was, leaving literary critics to speculate endlessly over this in the years since the Narnia novels were first published. For over half a century, scholars have laboured to show that Lewis’s apparently disorganised Chronicles of Narnia have an underlying coherence, pointing to such possible unifying themes as the seven sacraments, the seven deadly sins, and the seven books of Spenser’s Faerie Queene. None of these explanations has won general acceptance and the structure of Narnia’s symbolism has remained a mystery. That is, until a little known Cambridge scholar named Michael Ward came along recently and apparently solved the enigma. His theory was that medieval cosmology, a subject which fascinated Lewis throughout his life, provides the imaginative key to the seven novels. In Ward’s view, the Narnia stories were designed to express the characteristics of the seven medieval planets – Jupiter, Mars, Sol (the Sun), Luna (the Moon), Mercury, Venus and Saturn. Although this intriguing theory has not won universal acceptance, Ward certainly makes a compelling case. Ward puts forward the idea that, using these seven planetary symbols, Lewis secretly constructed the Chronicles of Narnia so that in each book the plot-line, the ornamental details and, most importantly, the portrayal of the Christ-like figure of Aslan, all serve to communicate the governing planetary personality. Before I expand on this theory by reference to each of the seven Narnia books I should mention that an element of medieval planetary cosmology survives to this day in the form of the names of the seven days of the week. Saturday is the day of Saturn; Sunday is the day of the Sun and Monday is the day of the Moon. As I said in my post on the Norse Myths, Tuesday is the day of the Viking war god Tyr, whose Roman equivalent was Mars and hence in French Tuesday is Mardi – the day of Mars. Similarly Mercredi is the French word for Wednesday and is named after the Roman deity Mercury, who was a god of magic and hence equivalent to the Norse god Odin or Woden, who gives his name to the English term for this day. In French Thursday (the day of Thor, the Norse god of thunder) is Jeudi, the day of Jove or Jupiter, the Roman god of thunder. The Norse love goddess Frigga has Friday named in her honour in English, while in French her counterpart Venus, also a goddess of love, gives her name to Vendredi. Taking the Narnia books in turn, The Lion, the Witch and the Wardrobe is the book of Jupiter. In his poem The Planets Lewis summarises Jupiter as being the planet of ‘Winter passed and guilt forgiven’ – as good a five word summary of the plot of Lion as it is possible to provide. 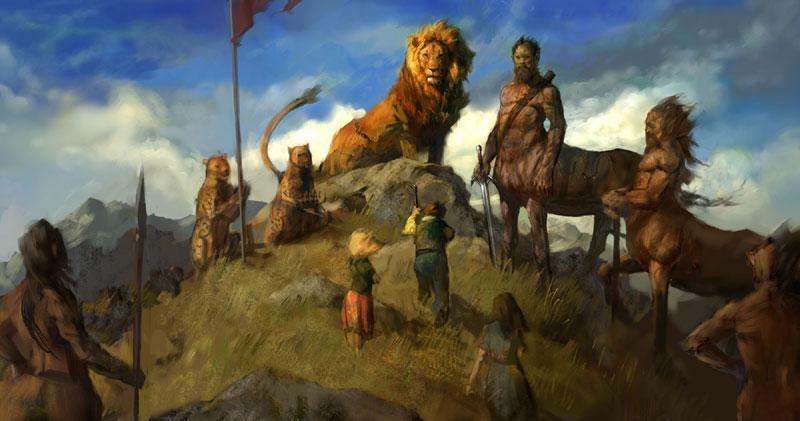 Jupiter also inspires the ‘lion-hearted’ (a reference to Aslan) and influences people so that they turn into ‘helms of nations’ (which is what happens to the four child protagonists in the book). Lion is full of ‘jovial’ imagery traditionally associated with Jupiter, including oaks, minotaurs, wolves, beavers, fauns, and, in the otherwise slightly out of place appearance of Father Christmas, a jolly, red-faced character who recalls how Roman generals rouged their faces to celebrate victories in honour of Jupiter. Mars is best known as the god of war (hence the term martial) and Prince Caspian is therefore primarily full of warlike imagery. However, since the god is also known as Silvanus (‘god of the woods’) the book also features forests – most spectacularly in the form of trees marching to war at the end. The Voyage of the Dawn Treader is the book of Sol, the sun – the clue is in the title! The Roman sun god was Apollo, who was also known as Apollo Sauroctonus or dragon-slayer, which accounts for the preponderance of dragons in Dawn Treader, including at the prow of the eponymous ship. It’s also worth mentioning that the sun god was sometimes also called Apollo Smintheus or mouse-catcher – perhaps explaining the prominent role of the talking mouse Reepicheep in the story! Again, the clue to the planetary symbol for The Silver Chair is in the book’s title, for silver is the metal most closely associated with the Moon. Lunar imagery abounds in this novel, both in terms of magic – more than one character is put under a spell in The Silver Chair – and madness, which again afflicts several characters, including the child protagonists, at one time or another. The negative associations of silver in this novel are in sharp contrast to the description several times of Aslan and all that is good as ‘golden’. Mercury, the winged messenger of the gods, gives his name to the term mercurial, which is commonly used to refer to something or someone erratic, volatile or unstable. In astrology Mercury is ruled by Gemini, which consists of the stellated brothers Castor and Pollux, explaining the preponderance of brothers in The Horse and His Boy – Cor (Shasta) and Corin, Dar and Darrin, Cole and Colin etc. In particular the parallels between Castor and Pollux on one hand and Shasta and Corin on the other are notable – Homer described Castor as a great breaker of horses (hence Shasta’s close friendship with the talking horse Bree) and Pollux as a renowned boxer (like Corin ‘Thunderfist’ in the novel). Venus, being the divine mother and goddess of love, is present in The Magician’s Nephew in the form of Digory’s mother. Venus also has a dark side, however, in the form of ‘Venus Infernal’ (who is often equated with the Babylonian demon goddess Lilith) and thus also appears in the book as the terrifying Queen Jadis, who later becomes the White Witch. As befits the book associated with the goddess of love, The Magician’s Nephew is full of images of fertility, in the form of the garden, the wood between the worlds and the pairing off of the animals by Aslan at the creation of Narnia. Finally, The Last Battle is the book of Saturn. In Classical mythology Saturn had a somewhat dark aspect (he famously devoured his sons) and hence the term saturnine is used to describe someone who appears gloomy, melancholy or sullen. It is therefore fitting that the final Narnian chronicle is in many ways by far the darkest – full of death, loss and betrayal. Saturn was also known as Cronus, the Greek god of time, and hence he makes a direct appearance in The Last Battle as Father Time. This was very interesting to read. Though I must say I very strongly disagree about Ward’s view of it. Yes, it seems strong, but Satan can also seem strong. I firmly believe that C.S. Lewis wrote these books with a parallel to the life and death of Jesus Christ. To me that is very evident. I often wonder what Lewis would think if he knew all the controversies over his books. I just think that he wrote them in the simplest form, using his books to parallel Christ’s life, in his own way, and now so many people (like with just about everything else that is centered around Christ) try to make it more complicated and come up with more reasons. Hmm. Interesting. Although the story is also very allegorical to the Bible, and 7 is the holy number in the Bible. Just sayin’. But this is interesting. It’s possible that that’s true, I suppose. Thanks, I hadn’t even thought of that! Well said, Mr. Silverlock! BTW, do you happen to know what religion Lewis converted to Christianity from? Atheism. It’s a very long story but the short version is that Lewis was baptized a Christian, became an atheist at 15 and then converted back to Christianity in later life. It is interesting to note that Lewis actually converted to theism first (in 1929) and it was just over two years later that he became a Chrstian. I struggle to believe that Lewis had cosmology in mind when writing the books. I believe the hidden message was that of the Bible. MN was the creation story. LWW was like that of the gospels, a redemption story in which one pure and holy gave his own life for the misdeeds (sins) of others. The Caspian trilogy (PC, VDT, and SC)shows the struggles of believers in their day to day life. HHB is one of someone who comes from a totally different world view finding their way to what may seem so obvious to one born into it. LB is the ending of the world, like the book of Revelation in the Bible. Paperclip101 is right, though. 7 is one of the numbers of perfection in the Bible- 3, 12 and several numbers also join that category. Ooh, that’s interesting. I didn’t realize Lewis was so fascinating! It’s interesting, being in the musical version of Narnia (The Lion, The Witch, and the Wardrobe) made me notice allegorical things that I missed in the books but were definitely there. I think one of C.S Lewis more obscure works entitled ‘Of This and Other Words’ which was a compilation of essays on the subject of Fantasy, storytelling and Literature shed some light on the Narnia chronicles. I personally find it incredibly irksome when people ‘read’ meanings into stories which the author never intended to include, and then insist that these are what the stories were ‘supposed’ to be about. The Chronicles of Narnia are not among these, because Lewis made thier allegorical nature and Christian undertones obvious, but people who claim that the Harry Potter novels are really Christian allegories are a prime example.